Arusha is a city of Arusha region in north-eastern of Tanzania with an area of 24,728.6 sq km, part of Arusha region with an area of 82,428.5 sq.km out ofthis a total area of 3,571 sq.km. or 4.3 percent is covered bywater bodies of Lakes Eyasi, Manyara, Babati and Natron. The remaining 78,857.5 sq km is a land area with a population of 416,442 inhabitants. The region has a common border with Kenya in thenorth, to the east it borders with Kilimanjaro and Tanga regions. Arusha is a Tanzania hub for major international diplomatic as it hosts the East African Community and since 1994 it hosted the International Criminal Tribunal for Rwanda. It is a multicultural city with a majority African population, large Arab and Indian minorities, and many European and American experts, engaged in diplomatic affairs and the fast-growing local tourist industry. It is surrounded by hills to the north and east with a local habitat of a mix of savannah woodlands where its population with the main ethnic groups of Iraqw, Arusha, Maasai, Meru and Barbaig mixed with others Sonjo, Gorowa, Rangi, Chagga, Pare and Nguuin small numbers have lots to share. Arusha is served by Kilimanjaro International Airport [JRO]located about 60 Kilometres east of the city on the way to Moshi, the town of Mt. Kilimanjaro. The airport provides international and domestic flights to both international and national travellers. In addition, the city in its west has a domestic Arusha Airport [ARK] serving more than 87,000 passengers yearly. There are regular buses and coaches from and to Dar es Salaam, Mwanza, Dodoma, Moshi, Tanga in Tanzania mainland and from and to Nairobi in neighbouring Kenya. The City is located between latitudes 6.36 degrees and 7.0 degrees to the southof Equator and longitudes 39.0 and 33.33 to the east of Greenwich. It isbounded by the Indian Ocean on the east and by the Coast Region on the othersides. The total surface area of Dar es Salaam City is 1,800 square kilometres, comprising of 1,393 square kilometres of land mass with eight offshore islands, which is about 0.19% of the entire Tanzania Mainland’s area. Dar es Salaam city has a population of 4,364,541 according to Census 2012. The City was originally dominated by Zaramo and a few other tribes especially Ndengereko and Kwere. However, due to urbanization many people of differentethnicity and origins have immigrated to the city in big numbers resulted in a cultural diversification. Dar es Salaam has a unique status, being the major City of Tanzania and the centre of countrywide government administration, industry, commerce and banking activities, despite of the Government decision to move its capital to Dodoma. Dar es Salaam is also the major port City of Tanzania. It has more than 575 majorindustrial establishments, a Central Bank, Commercial Banks, Foreign Exchange Bureaus, and Business companies in all sectors. Dar es Salaam city being the centre of Tanzania history, commerce and administration for many economic sectors, a city tour of will take you to the museums such as the National Museum, the Nyerere Cultural Centre, and the Village Museum; to markets such as Mwenge Carvings Market, the Magogoni Fish Market, and the largest in the country Kariakoo; to historical places such as Askari Monument, State House, St Peter’s Church, St Joseph Cathedral; to Botanical Gardens and Beaches and Coastal areas; and, interesting spots facilities. There are many international flights from overseas to Dar es Salaam via the Julius Nyerere International Airport [JNIA] to include Emirates, Turkish Airlines, KLM, Kenya Airways, Dubai Air. There are domestic flights from and to Dar es Salaam city connecting you to nearly all parts of Tanzania mainland and Zanzibar such as Arusha, Mwanza, Tanga, Zanzibar, Kigoma, Mtwara, Bukoba, Mbeya and to the National Parks and Game Reserves. There are regular buses and coaches from Dar es Salaam and to all parts of Tanzania mainland and neighbouring countries of Zambia, Malawi, Uganda, Kenya, and, Rwanda. Mwanza is a city of 0.8 million people increasing at a rate of 11% per annum and spread over 1,325 kmof which 900 kmis covered by water and 425 km is dry land. Approximately 86.8% km(20%) of the dry land is urbanized and the rest is forest, valleys, cultivated plains, grassy, and undulating and rocky hill areas. Mwanza Region, Lake Victoria Zone, and neighbouring countries of the “Great Lakes Region” It is also a major transit centre of goods destined for neighbouring countries such as Uganda, Rwanda, Burundi, and Democratic Republic of Congo. In the shores of Lake Victoria in north-western Tanzania, Mwanza city famously know as “Rock City” due presence free standing large rocks, was founded in 1892 as a regional administration and commercial centre to control mainly export production of the cotton growing areas in the Lake Victoria. The main ethnic groups in Mwanza City are the Sukuma, Zinza, Haya, Sumbwa, Nyamwezi, Luo, Kurya, Jita and Kerewe with other small groups inhibiting from across the country. The people of Sukuma tribe dominate by 90 percent of the population. Mwanza is also a city of industries, commerce and banking activities. It has number of industrial establishments, Commercial Banks, Foreign Exchange Bureaus, and Business companies in all sectors. A visit to Ukerewe Island, a big island situated in the north of Mwanza[in Lake Victoria]referred to as “little Zanzibar”, a truly place to relax and watch the beautiful nature of the lake ecosystem. Mwanza is served by both international flights from Kenya and Uganda, and domestic flightsto and from Dar es Salaam, Zanzibar, Arusha and Kilimanjarovia the Mwanza Airport [MWZ] with daily flights from Kilimanjaro and Dar es Salaam. There are dailybuses and coaches to and from Dar es Salaam and to all parts of Tanzania mainland and neighbouring countries of Bujumbura (Burundi), Kigali (Rwanda), Nairobi (Kenya) and Kampala(Uganda) through the all way tarmac roads. Mwanza is accessed also using daily trains to and from Dar es Salaam city booked up to 2-3 weeks in advance. Mwanza is accessed by ferries only through Bukoba town [in Tanzania]every Sunday, Tuesday and Thursday evening. If you are arriving from Uganda, take a bus from Kampala to Bukoba [in Tanzania] and connect to the ferry, MS Victoria. Moshi town is a Tanzanian municipality with a population of 184,292 according to the 2012 census. The municipality is in the Kilimanjaro Region and is situated on the lower slopes of Mount Kilimanjaro, covering an area of 59 km². Moshi town serves as the base for expeditions up the “Roof Top of Africa”,Mount Kilimanjaro and cultural tourism programs operating on the lower slopes of the mountain. Moshi is always referred to as “the Town of Mt. Kilimanjaro” is at the base of Africa’s highest mountain and a home to mainly Chagga tribe-people. Other small ethnic groups residing the town after the independence are Pare, Wakahe, Sambaa, Indian, and Arabs. Moshi town has also a good number of European and American experts. It lies on the east to west road linking Arusha and Mombasa in Kenya, and it is very close, about 35 Kilometres to Kilimanjaro International Airport [JNIA]. Germany established a military camp in Moshi (Neu-Moschi) in August 1893 with the northern line railroad reached Moshi in 1912. Moshi is a city ofcommerce, coffee production and marketing and banking activities. It has number of coffee establishments, Commercial Banks, Foreign Exchange Bureaus, and Business companies in all sectors. Moshi hosts a number of higher education facilities. Those include theKilimanjaro Christian Medical College (KCMCo), the Stefano Moshi Memorial University College (SMMUCo), the Mwenge Catholic University (MWECAU), the Moshi Co-operative University (MoCU), the College of African Wildlife Management (CAWM), the Kilimanjaro School of Pharmacy (KSP), and the Tanzania Training Centre for Orthopaedic Technologists (TATCOT). Visit to Lake Jipe, NyumbayaMungu, and the Lake Chala, a crater lake in a Calderon the borders of Tanzania and Kenya on the eastern edge of Mount Kilimanjaro. The lake is home to the endemic Lake Chala Tilapia [Oreochromishunter]. Moshi is served by the Kilimanjaro International Airport [JRO] for international and domestic travellers from all corners of the world. The airport is located about 35 Kilometres from Moshi on the way to Arusha. Moshi has also domesticcharter flightsthrough the Moshi Airport [QSIto and from Dar es Salaam, Zanzibar, Arusha, Kilimanjaroand National Parks serving both international and domestic travellers. There are dailybuses and coaches to and from Dar es Salaam, Mwanza, Tanga, Dodoma, and Mbeya and neighbouring countries of Kenya [Nairobi] and Uganda [Kampala] through the all way tarmac roads. Zanzibar Citysimply referred to as Zanzibar, is the capital and largest city of Zanzibar, in Tanzania. It is located on the west coast of Unguja, the main island of the Zanzibar Archipelago, roughly due north of Dar es Salaam across the Zanzibar Channel. Zanzibar City has a population of approximately 205,870 people with a diverse culture. Zanzibar City comprises of two areas, the Stone Town and Ng’ambo [“The Other Side”] whichwere historically divided by a creek, now marked by a large street called Creek Road. Stone Town is the historical core of the city because of its unique architecture and culture also declared by the UNESCO World Heritage Site in 2000. Ng’ambo is a much larger, modern area that developed around Stone Town after the Zanzibar Revolution, with office buildings and large apartment blocks such as those of the Michenzani neighbourhood. Zanzibar flourished as a trading centre during the 19th century, especially renowned for spices and slaves commerce, the origin of Zanzibar tourism. Zanzibar people areof diverse ethnic origins, with the first been the ancestors of the Bantu Hadimu and Tumbatu. Zanzibar is today mostly inhabited by ethnic Swahili, a Bantu population, Arabs, as well as Indians. A great number of residents in Zanzibar speaks Swahili, English French and Italian as a result of Tourism. The Darajani Market is the main bazaar of Zanzibar, one of the main attraction to visitors because of its colourful, chaotic maze of stalls selling everything from kangas to exotic fruits to consumer electronics. Stone Town [Zanzibar City]is served by the Abeid Aman Karume International [ZNZ] Airport with both international and domestic flights from and to mainland Tanzania, Arusha, Dar es Salaam, Moshi, and Tanga as well as Nairobi and Mombasa in Kenya and Johannesburg, in South Africa. At Stone Town’s harbour ferriesthat departs within an interval of every hour an on daily basis to and from Pemba Island and Dar es Salaam. Tanga City is located on the shores of the Indian Ocean in northeast Tanzania. It has a land area of 474 square Kilometres with an estimated population of about 273,332 people according to National Census 2012. It is the administrative city of Tanga region situated at the extreme northeast corner of Tanzania between 40and 60degrees below the Equator and 370-39010’degrees east of the Greenwich meridian. 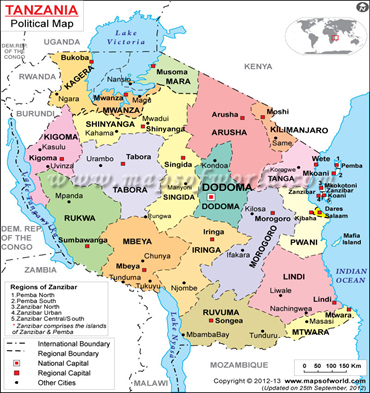 Theregion occupies an area of 27,348 sq Kms, sharing borders with Kenya, Morogoro, Coast, Kilimanjaro and Arusha in Tanzania. In comparison to other Tanzanian cities and towns, Tanga City has the best economic and social infrastructure in the country, and is well connected by road, railways lines, Domestic Airport and telecommunications. Tanga is the seaport city situated in the northeast of Tanzania very close the islands of Pemba and Zanzibar. The City is thesecond largest port, third largestIndustrial center in Tanzania, and also the headquarters of Tanga Region, Tanga District and Tanga City Council. Tanga city has institutions in medical and livestock research, the largest Regional hospital and companies offering financial services. An airport provides air services to other urban and tourism centers in the country. It was known to Shirazi Persians over a thousand years ago, had thriving trade links with Asia and the Middle East in the 13th Century, and became a continental gateway, including for the colonial activities of Omani Sultans, the Germans and British. During the past century and half, it developed functions as a transport, commercial, administrative, military and urban-industrial hub and as an important engine of the Regional and National economy. Tanga people are originally Digo ethnic group, however other ethnics groups namely Sambaa, Zigua, and Bondei migrated to the city from other parts of Tanga region. There are other small ethnic groups such as Segeju, Duruma, Mbugu and Pare, and small population of Asians and Europeans living in the city. Mysterious Amboni Caves located about 8 km north of Tanga City. The caves are the most extensive limestone caves inEast Africa, and were sculptured bynature into a fascinating undergroundworld of halls, chambers, nichesand tunnels, some equipped withstalactites and stalagmites. Toten Island in Tanga Bay.The island is covered by a lushcoastal forest with huge baobabtrees and has also ruins of early settlements. Toten Island also has small beaches and nature trails crisscrossing the forest and ruins and can be visited by boats, arranged by hotels and tour operators in Tanga. Gallanos Hot Sulphur Springs located about 8 km from Tanga City and only 3 km from the Amboni caves. People visits these hot and sulphurous springs for their healing properties, especially for skin ailments. Tanga City is served by the Tanga Airport [TGT] for domestic flights from and to Arusha, Dar es Salaam, Moshi, and Zanzibar. There are dailybuses and coaches to and from Dar es Salaam, Mwanza, Arusha, Kilimanjaro, and Morogoro and neighbouring countries of Kenya [Mombasa] through the all way tarmac roads. It was founded at the end of the 18th century. It was the original capital of German East Africa and was one of the most important trading ports along the East African coast. It has a population of about 311,740 people and is recently being considered as a world heritage site. Bagamoyo was the most important trading centre of the east central coast of Africa in the late 19th century. Bagamoyo’s history has been influenced by Indian and Arab traders, by the German colonial government and by Christian missionaries.Until the middle of the 18th century, Bagamoyo was a small and insignificant trading center where most of the populations were fishermen and farmers. The main trading goods were fish, salt, and gum, among other things. In the late 18th century Muslim families settled in Bagamoyo, it became a trading port for ivory and the slave trade, with traders coming from the African interior, from places as far as Morogoro, Lake Tanganyika and Usambara on their way to Zanzibar. The slave trade in East Africa was officially prohibited in the year 1873, but completely well to the end of the 19th century. Currently, Bagamoyo is a centre for dhow sailboat building, tourism and artworks. The Bagamoyo College of Arts is an internationally famous arts college in Tanzania, teaching traditional Tanzanian painting, sculpture, drama, dancing and drumming. People residing Bagamoyo are diverse in nature than some other areas of the country. Ethic groups found here includes Wakwere, Wazaramo, Wazigua, Maasai, and Waswahili. Other different cultures coexist in Bagamoyo, including people of Arab descent. Bagamoyo town is served daily buses to and from Dar es Salaam through the all way tarmac road. Mbeya city is located in southwest of Tanzania with a population of 385,279 people according to 2012 Census. Mbeya city is the capital of Mbeya region with a total population of 2,707,410 people. When travelling from Zambia, one of neighbouring country, Mbeya is the first large urban settlement to encounter. Mbeya is situated at an altitude of 1,700 meters above the sea level, and sprawls through a narrow highland valley surrounded by a bowl of high mountains. Mbeya was founded as a gold mining town in 1920s following the 1905 gold rush. The city which attracted a British administration until 1961 had also attracted migrants and small entrepreneurs and later developed into a growing metropolis and business centre for the southern regions and the neighbouring countries of Malawi, Zambia and Congo. Mbeya City is well connected with an all-weather [tarmac] road that forms part of the “Great North Road” running from Cape Town in South Africa to Alexandria in Egypt. The main ethnic groups in the city are the Safwa, Malila and Nyakyusa. Others are Sangu, Bena and Wanji and small ethnic groups to include the Masai and Sukuma. Most of these ethnic groups are predominantly agro – pastoralists. Mbeya city belongs to the tourism circuit which commands several attractions including extension of Ruaha National Park, Usangu and Lukwati Game reserves, mountains, Sandy beaches on Lake Nyasa shores, the Rift Valley Plains, unique ecological features of rain forests, historical features as well as cultural tourism. In addition there are open areas with a good number of wildlife like Piti, kipembawe, Kwimba in Chunya and Usangu open areas in Mbarali district. With the establishment of Kitulo National Park and Mpanga/Kipengere Game reserve famous for its unique birds and flowers, the Region attracts massive number of tourists. The unique ecological features of the tropical rain forest. The wildlife in the Lukwati Game Reserves in Chunya district. Mpanga – Kipengele Game Reserve in Mbarali district. Protected variety of Game stock and wild animals such as rare monkey species known as Rungwecebus kipunji. The Rift Valley – Usangu plains. The warmth of Lake Nyasa and Rukwa. Sandy beaches of lake Nyasa. A unique Ngosi Crater Lake, located on top of Rungwe rainforests and other crater lakes of Masoko and Kisiba in the Rungwe District. Ihefu wetland systems in Ruaha river basin which can be toured by flying boats. Meteorite site in Mbozi “Kimondo cha Mbozi”. This is a rare and spectacular sight and is the eighth largest meteorite in the world, weighing about 12 tonnes. Mbeya city in southern regions has a new airport since 2006 that provides air-links with other airports such as Dar es Salaam, Kilimanjaro, Mwanza and Dodoma. Transportation in Mbeya is frequent and there are regular bus services from and to Iringa, Morogoro, Dar es Salam, Dodoma, Arusha, Moshi and Songea and to many other regions countrywide.